With their fourth win during the last five games, Westchester improves to 12-8, and more importantly, is now 4-1 in Region XV and Mid-Hudson Conference play. The teams played even baseball during the first three innings, but it was during the fourth inning that Franzese and company took over. CJ Sager (Mahopac, NY/Mahopac HS) singled home Jose Delacruz (New York, NY/George Washington HS) to break the tie, and put Westchester into the lead for good. After James Houlahan (Yorktown Heights, NY/Lakeland HS) singled home Sager, Franzese destroyed a one strike pitch over the right field fence to make it 6-1. Later in the inning, Bobby Wootten (Ardsley, NY/Ardsley HS) scored on a wild pitch for a 7-1 lead. Ulster scored a run during the bottom of the frame to close the gap just a bit. An inning later, Westchester scored two more runs to make it 9-2, but three runs by the hosts during the bottom of the fifth inning made it a 9-5 game. During the top of the ninth inning, Westchester put the game away. With one out, Sager singled home Delacruz to make it 10-5. Three batters later, Scottie Giordano (Croton, NY/Croton-Harmon HS) singled home Sean Vanegas (Bronx, NY/Mount St. Michael) for an 11-5 lead. Then Franzese ended the scoring in resounding fashion, smashing a home run over the right centerfield fence to score three runs, and give WCC the nine run win. Delacruz, Sager, and Houlahan had two hits apiece for Westchester. Michael Matalavage (Croton, NY/Croton-Harmon HS) earned the win after pitching 2.2 innings of shutout ball in relief of Nick Cona (Cortlandt Manor, NY/Panas HS), who pitched another strong game for WCC. Steve Messerschmitt (Carmel, NY/Carmel HS) gave the Vikings 2.1 solid innings of relief without allowing a run. FRIDAY APRIL 13, Freshman Christian Lovecchio (North White Plains, NY/Valhalla HS) belted his first career dinger, and drove in four runs during an outstanding day at the plate as WCC survived a marathon of a game, 10-9 on Friday afternoon at Ulster CC. With the win. One day after downing the host Senators, 14-5, WCC seemed poised to put things away early once again, scoring five runs during the first two innings, including back-to-back home runs by Lovecchio and CJ Sager (Mahopac, NY/Mahopac HS) during the top of the second inning, and the Vikings led 5-0 heading into the bottom of the second inning. However, Ulster rallied for two runs in the bottom of the second inning, three runs in the bottom of the fourth, and one run an inning later to take a 6-5 lead. Westchester tied things in the top of the six inning when Sager doubled, and was brought home by a Sean Vanegas (Bronx, NY/Mount Saint Michael) single, but two Ulster runs during the bottom of the frame gave Ulster an 8-6 lead heading into the seventh inning. Westchester tied things in the top of the seventh inning when Lovecchio drove in James Houlahan (Yorktown Heights, NY/Lakeland HS), and Sager drove in Lovecchio to make it 8-8. After Ulster took a 9-8 lead during the bottom of the seventh inning, the Vikings took the lead for good during the top of the eighth inning. With two on and two out, Lovecchio belted a two-run double, scoring Houlahan and Paul Franzese (Somers, NY/Somers HS) for a 10-9 lead. Ulster had a chance to win the game in the bottom of the ninth inning as the Senators had runners at second and third with two outs, but pitcher Scottie Giordano (Croton, NY/Croton-Harmon HS) notched a strike out to end the game. Lovecchio went 3 for 5 with his home run and four RBI’s, while Sager and Giordano both went 3 for 5 with a home run and two RBI’s. Houlahan and Vanegas each had two hits. Overall, each team had 15 hits, and combined for eight home runs with Westchester hitting three. Giordano earned the win, allowing two earned runs over four winnings, striking out six. SATURDAY APRIL 14 Nicholas Antenucci (Yonkers, NY/Stepinac HS) picked up where he left off in his last start as his solid pitching led the Vikings to a 6-4 victory in Game 1 of their double dip versus Ulster on Saturday. Through four innings, the sophomore faced just one batter over the minimum as he continued to hold the opponent scoreless. Trouble found him in the fifth though as two errors led to two unearned runs by Ulster. WCC got on the board right away when James Houlahan (Yorktown Heights/Lakeland HS) singled home Scottie Giordano (Croton, NY/Croton-Harmon HS), who walked ahead of him. Houlahan then scored on a sacrifice fly by CJ Sager (Mahopac, NY/Mahopac HS) and Paul Franzese(Somers, NY/Somers HS) was plated on a single by Bobby Wootten (Ardsley, NY/Ardsley HS). The Vikings extended their lead in the fourth inning when Sergio Osorio (N. White Plains, NY/Valhalla HS) scored on a Giordano double. Giordano then scored on a sacrifice fly by Houlahan. The nightcap was a different story, however, as the visitors scored seven runs during the first three innings, and cruised to a 10-1 win. The lone Viking run came during the fourth inning when CJ Sager (Mahopac, NY/Mahopac HS) scored on a Sean Vanegas (Bronx, NY/Mount St. Michael) single, but WCC was held to three hits during the game. For Westchester Community College sophomore pitcher Nicholas Antenucci (Yonkers, NY/Stepinac) the hits just keep on coming … that is, unless he just so happens to be on the mound. Four days after pitching his first career perfect game during an 11-0 win over Orange Community College on April 7, the righty is the NJCAA Pitcher of the Week. Antenucci retired all 15 batters he faced against the visiting Colts during a game shortened by the mercy rule, striking out six, and only allowing three balls to be hit out of the infield. For the season, Antenucci is currently 3-1 with a 3.51 Earned Run Average (ERA). His three wins and two shutouts lead the Vikings. Antenucci has walked only five batters, which is best among WCC starting pitchers, and his 16 strikeouts are second best on the team. Westchester Community College (11-8, 3-1 Mid-Hudson Conference/Region XV) returns to action on Thursday, April 12 when the Vikings travel to Ulster Community College for a 3:30 p.m. single game tilt to open a four-game series with the Senators. WCC returns home on Saturday, April 14 when they host Ulster for a noon doubleheader. 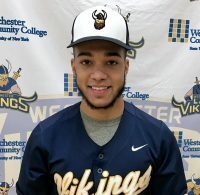 If his season debut at the college is a sign of things to come then Westchester Community College Sophomore Andy Perez (Ossining, NY/Ossining HS) has quite a year in front of him as a Viking. The 2nd year player shot an incredible 78 during Monday’s season-opening Suffolk Community College Tournament, the best individual score recorded on Monday by a single stroke. Overall, the Vikings finished in third place with a 397 team score to open the season on a strong note. Also for Westchester, Joseph Danko (Yorktown Heights, NY/Somers HS) finished with an 88, while Moises Alvarez (New Rochelle, NY/New Rochelle HS) shot a 112, and Matthew Rice (LaGrangeville, NY/Arlington HS) added a 119. SATURDAY APRIL 14 (Bayside, NY) – The second competition in the short history of the Westchester Community College Track & Field program yielded even more impressive results on Saturday at the Queensborough Community College relays in Bayside, New York. Several Viking competitors improved upon times registered during the opening week of competition at Wagner College. Sophomore Alicia Owens (Mount Vernon, NY/Mount Vernon HS) turned in perhaps the finest effort of the day, finishing third in the shot put at 8.97 meters, finishing only slightly behind the 9.65 winning distance. Owens’s 21.62-meter Javelin throw also gave her a top-15 individual finish. For the second consecutive week, WCC was terrific during distance runs as freshman Mia Colon placed sixth in her heat during the women’s 1500-meter run. Her 6:29.87 run placed her in the top-15 competitors in the event, which included primarily participants from four-year varsity programs. Finishing only slightly behind Colon in the 1500-meter run was Julia Welti, who completed her race in 7:02.82. Sophomore Selinamarie Colon was outstanding during the women’s 10,000-meter run, finishing in 47:21.60, not only earning her a top-10 finish in the event, but she also had the best time all day among Community College participants. On the men’s side, Marco Naulaguari highlighted the day with a 5:42.04 finish during the 1500-meter run, good for eighth place. In addition, Giovanni Castillo and Tristan Fordyce earned top-25 finishes in the Shot Put, and Castillo was a top-30 finisher in the Javelin.